As a business, it is crucial to have exceptional staff. It has taken a number of years to assemble this team of professional, skilled and dedicated team members. You can have the confidence that your car is being handled by some of the industry's leaders. Laurence’s passion for machinery started at an early age in his home town of Murwillumbah, NSW. Living next door to a mechanical workshop, he found himself in there every afternoon as a teenager. After finishing school, he decided to start his own business in IT, still finding himself tinkering with his cars during evenings and weekends. So, in 2011 Brintech Customs was established. Starting from a small garage in North Rocks with 1 employee, Brintech Customs moved to Seven Hills in 2013, now has 8 employees and is still growing. Laurence’s vision for the business is to continually challenge the norm with exciting new engine conversions that meet everyone’s needs. 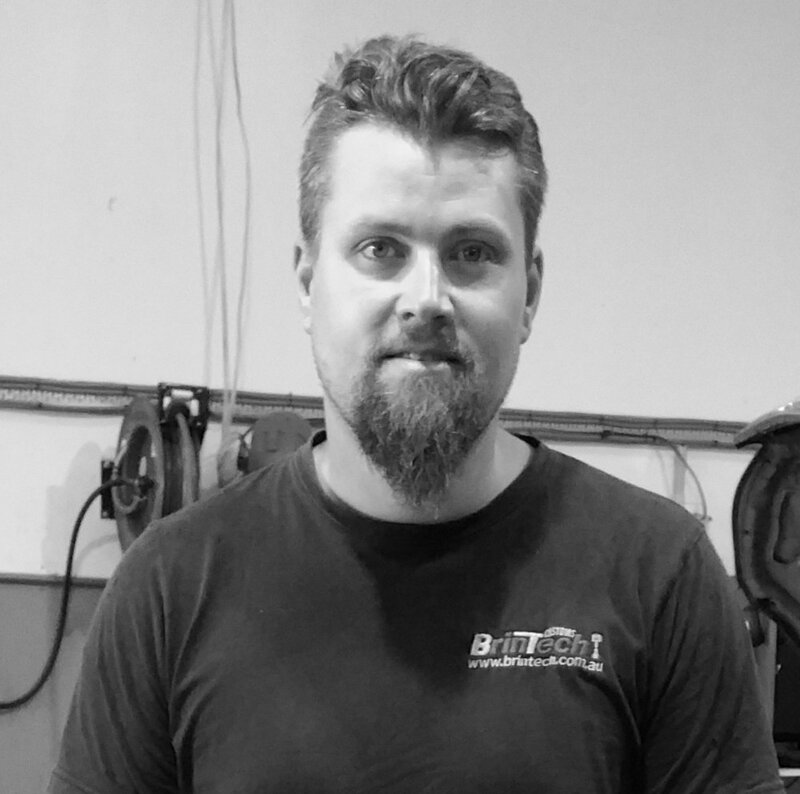 Josh started at Brintech in 2014, and with his 20 years of experience in the industry, he is definitely a highly skilled, well-rounded technician. He has an eye for technical ability and good quality work. Josh’s motivation to always push forward and achieve goals has led him to become an industry leader in coordinating builds and automotive work in the custom car industry. Being a master mechanic, Josh is able to instil and forge the proper techniques for up and coming technicians that work underneath him. Luis has always had a passion for cars and, according to his mother, used to tell everyone that he was going to be a mechanic when he grew up. As a teenager, he would often go cruising with his mates, and fell in love with his mate’s supercharged Toyota Corolla. After years of saving, he was able to get his first car at age 18, a ’76 Celica. He did the exhaust, and Dellorto Carby side draft. He then sold it to buy his first turbo charged car, a Mitsubishi Cordia. Luis got an apprenticeship with Peter Warren Ford at the end of year 12 and has been working as a mechanic ever since, starting at Brintech in March 2016. Jake’s enthusiasm for his cars started when his was 12. His dad and all his mates were in the car scene and he loved being part of it too. He got his first car at age 17, a Toyota Hilux. It wasn’t long before he got to work and put a stereo and exhaust, lowered it and put some fresh wheels. So, in June 2017, Jake decided to be the first person in his family to get a qualification and started an apprenticeship with Brintech. He loves all aspects of the job but especially loves making his customers happy. When he’s not busy whipper snipping the lawn and sculling a longneck at the same time, Jake is in the shop with his tools working hard on big projects. Cal joined the Brintech team in 2017. His great work ethic and love for custom work made him a perfect fit from the beginning. Being the youngest of his family with 3 older brothers, we can see why his love for cars started very early on for Cal. Back in his home town in South Africa, his brothers would always be modifying their cars in some way and he would help them do some pretty cool work. From this, he quickly gained the confidence to tackle engine conversions on his own E30, taking his 1.8L M40 out and replacing it with an M52 out of an E36. But he didn’t stop there. He then decided to put an M54 in his E30, and also bought an E36 and put a 3L into that. Cal manages to tackle and successfully complete projects that not many people have done before.